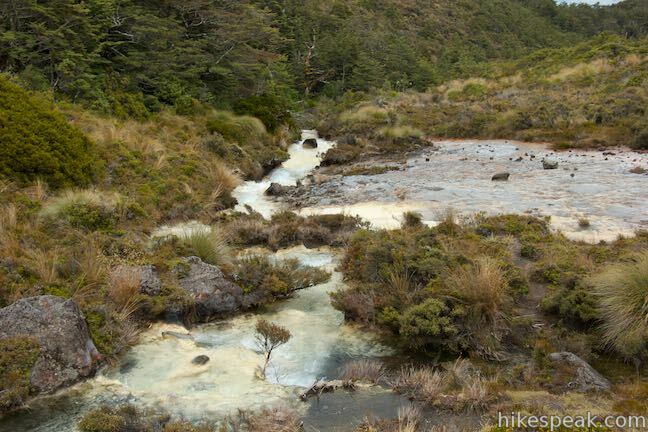 Silica Rapids Track explores improbable landscapes in Tongariro National Park, where cream-colored streams cascades over terraces of silica. 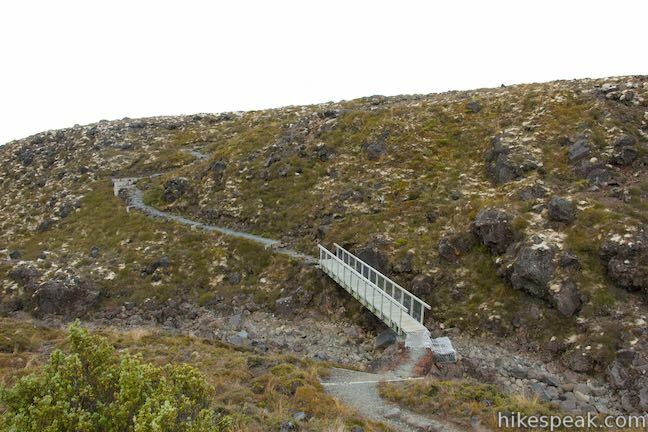 The 5.15-kilometer (3.2-mile) long track starts from Whakapapa Village and ends two kilometers farther up Bruce Road, allowing it to be explored as a point-to-point hike with the assistance of a vehicle or a 7.15-kilometer (4.45-mile) loop without one. 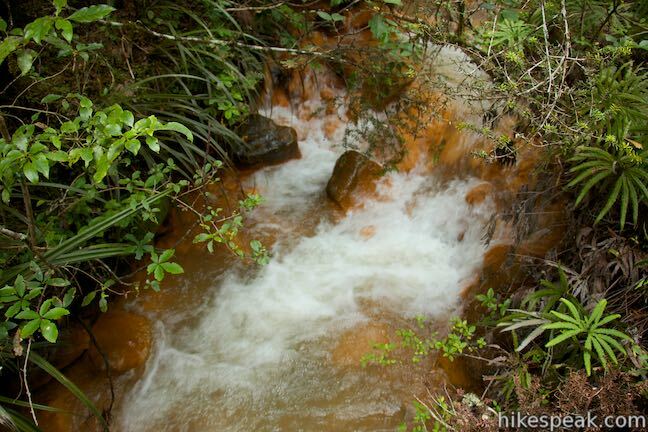 In addition to the Silica Rapids, the track passes various streams, including the Golden Rapids, where clays beneath a creek have a vibrant red-orange color. 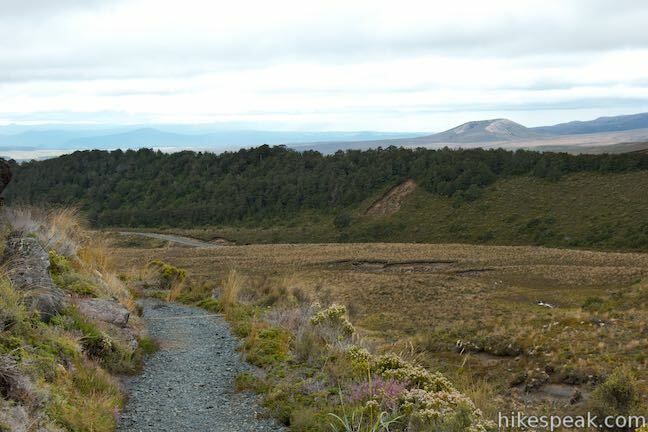 There are beach forests, alpine bogs, ridges of volcanic rock, and a fleeting waterfall along Silica Rapids Track as well, contributing to a varied hike in New Zealand’s Tongariro National Park. 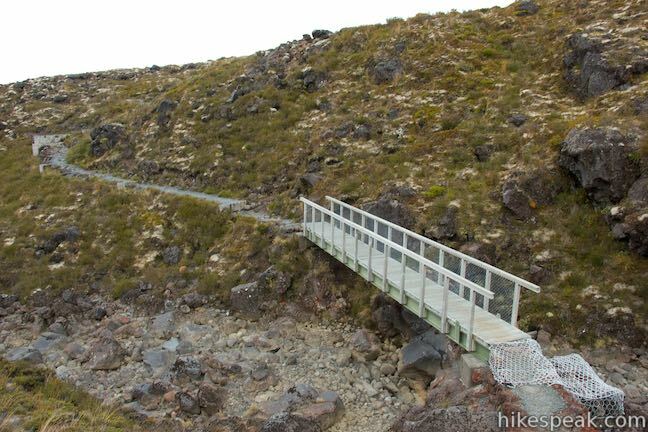 Start from a car park at the upper south end of Whakapapa Holiday Park, just off the main road through Whakapapa Village. 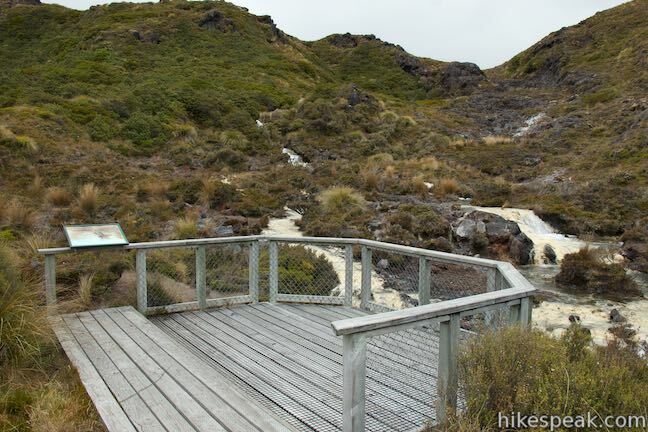 If you stay overnight in the holiday park, you can walk from your campsite right to the start of Silica Rapids Track, and the track is just a short walk from other accommodations in Whakapapa Village like Chateau Tongariro. 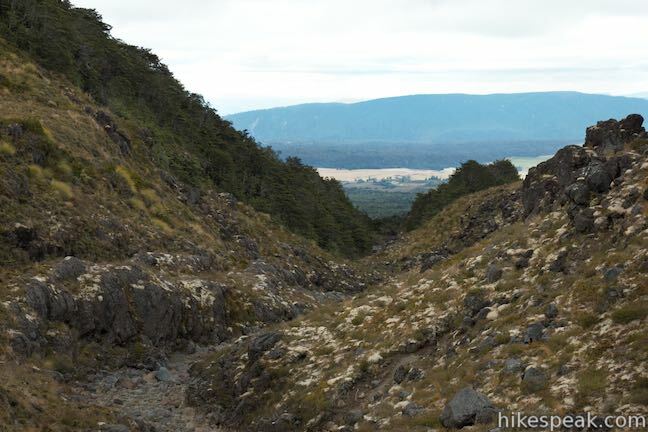 A sign at the car park lists the distance to Silica Rapids as 1 hour and 15 minutes and the distance to Bruce Road at the end of the track as 4 to 5 hours (although this seems like an exaggeration as the entire track can be hidden in under two hours). 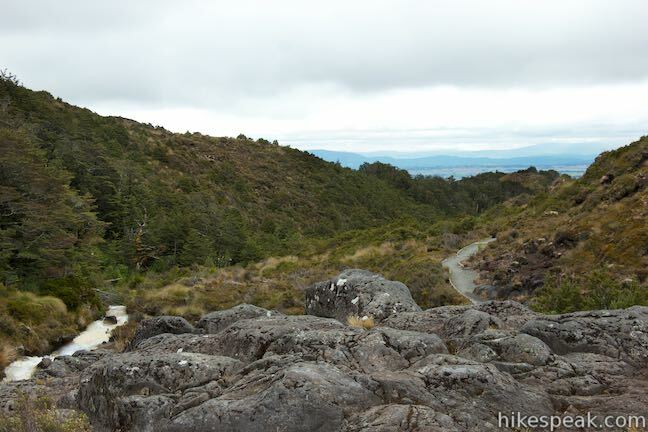 There are two junctions along Silica Rapids Track, which allow for additional travels to Whakapapaiti Hut (2 hours and thirty minutes), Mangaturuturu Hut (8 hours), and Ohakune Mountain Road (9-10 hours). 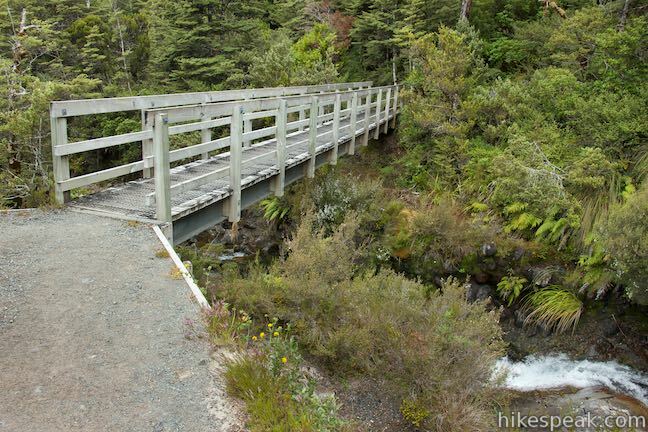 Set out down Silica Rapids Track, which immediately crosses a long bridge over Whakapapanui Stream. 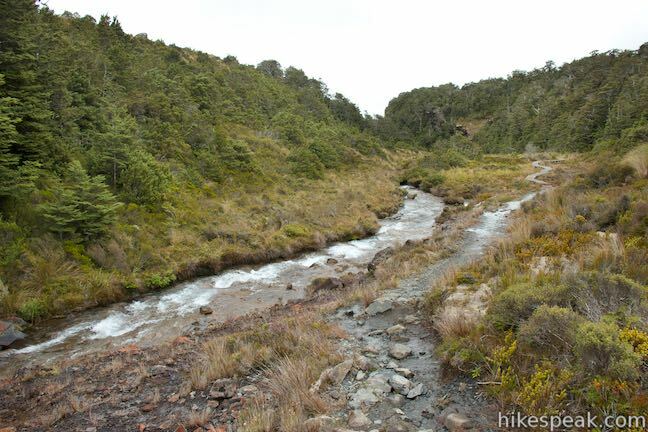 Look up and down the wide stream as it flows down a trench from Mount Ruapehu. 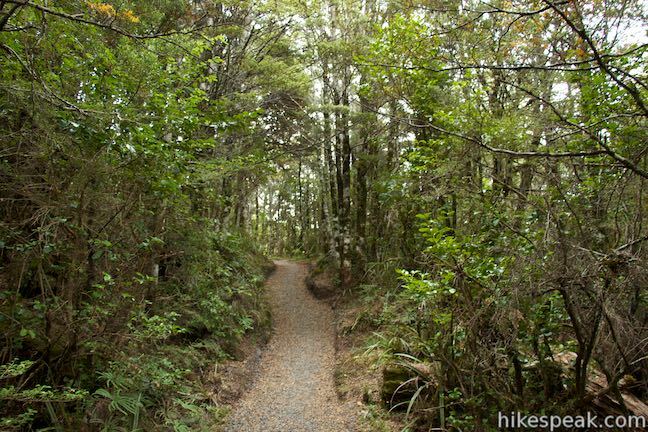 On the other side, proceed on a pleasant woodland walk that leads to a junction 450 meters from the start. 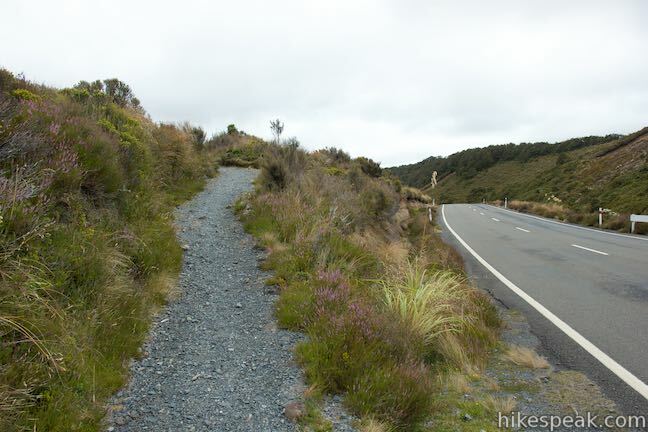 Whakapapanui Track breaks off to the right, descending parallel to the stream for 1 hour to a car park along State Highway 48 north of Whakapapa Village. 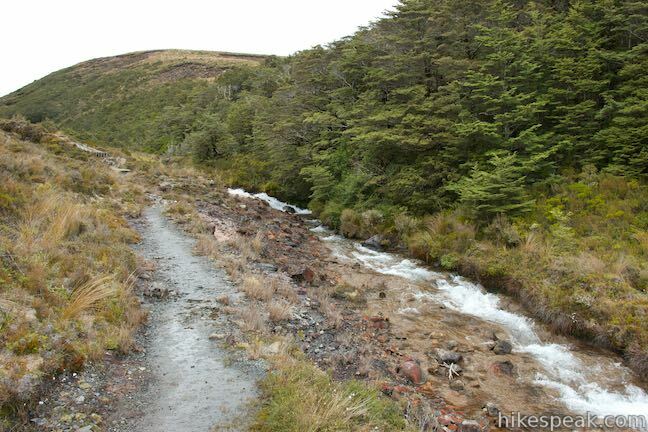 By starting on Whakapapanui Walk, one could extend the hike to Silica Rapids. 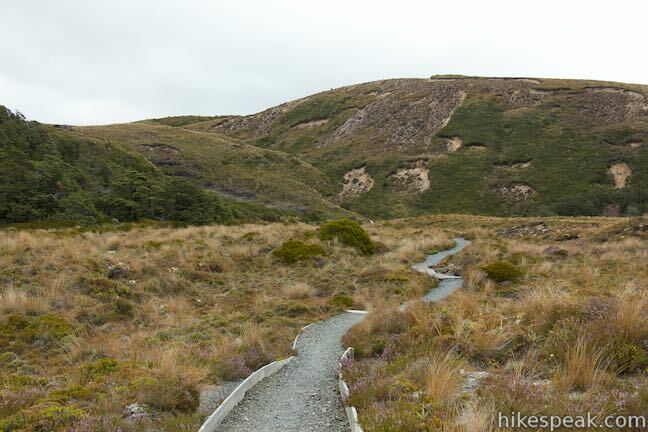 Continue straight (to the left) on Silica Rapids Track. 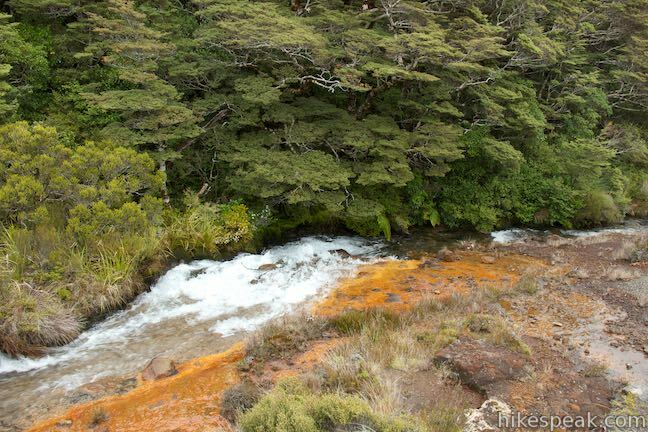 Rivers and streams in Tongariro National Park often carry minerals and chemicals that influence the acidity and coloring of the water and river banks. 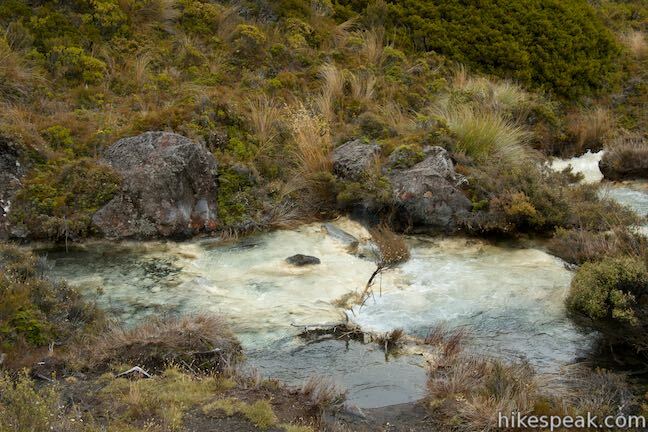 This is due to the chemical makeup of volcanic rocks. 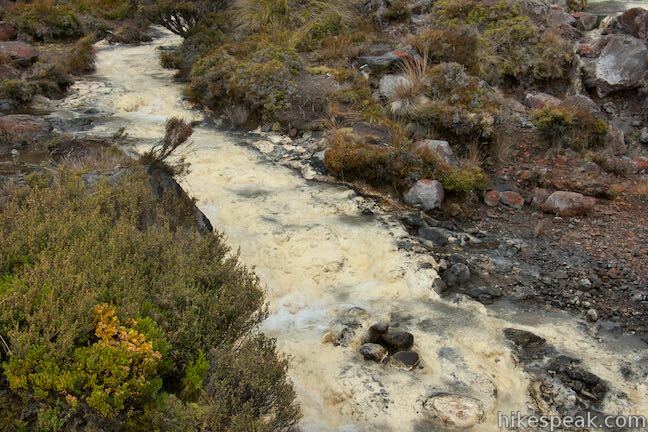 Here the Golden Rapids are coated with a deposit of aluminum rich clay that is leached from andesite rock and colored by iron oxides. 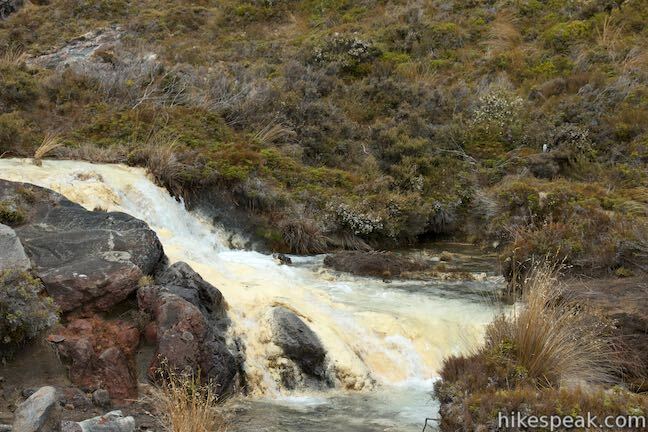 The turbulence of the water affects the amount of deposit. 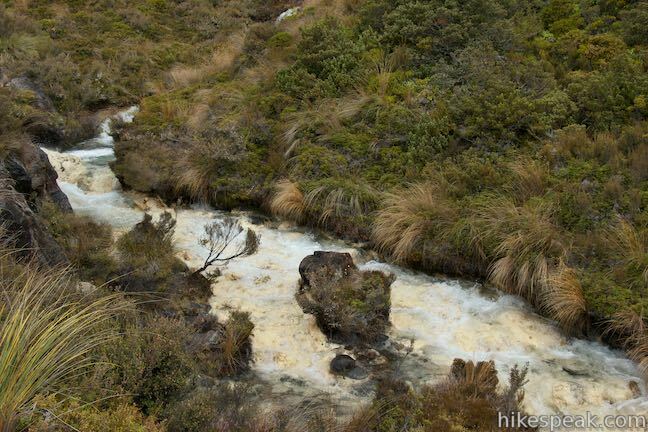 In high flows, less minerals are deposited than in low flows, resulting in a river bed that changes in color. 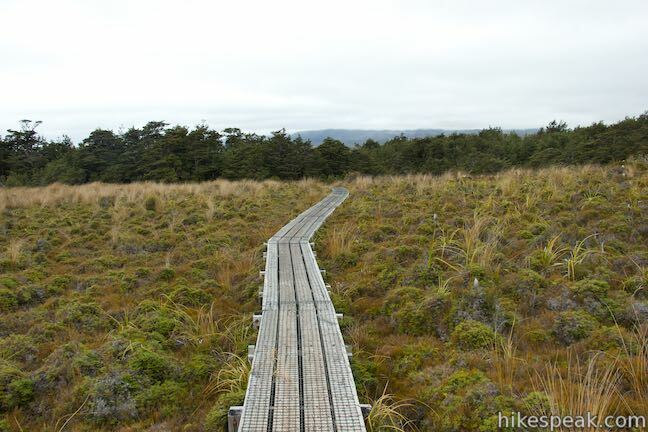 Bogs and wetlands are extremely fragile. 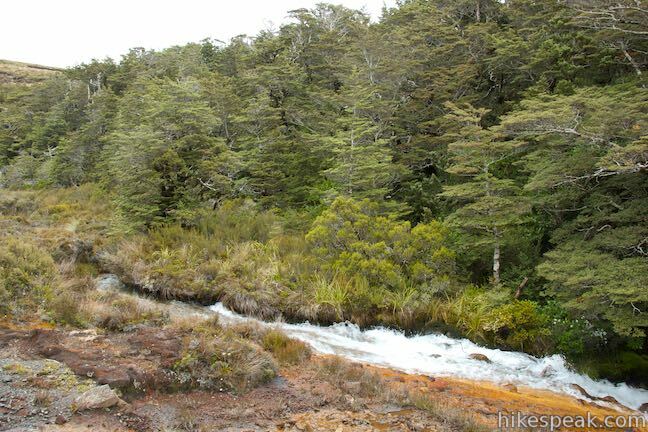 In this environment, it can take plants many years to establish. 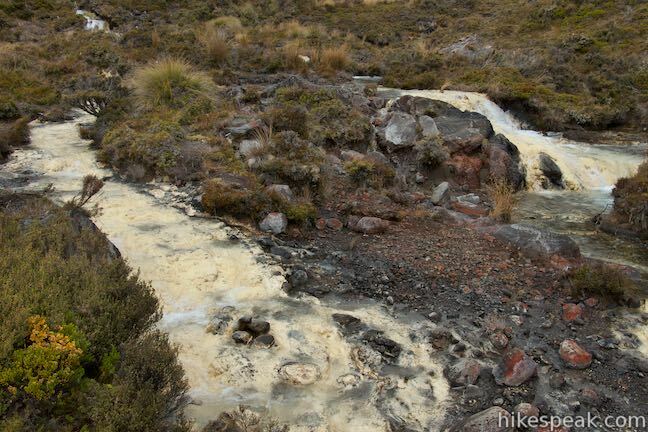 Poor drainage and low oxygen levels contribute to the soils acidic and peaty nature as an underlying thick blanket of ash creates a barrier, holding water closer to the ground surface. 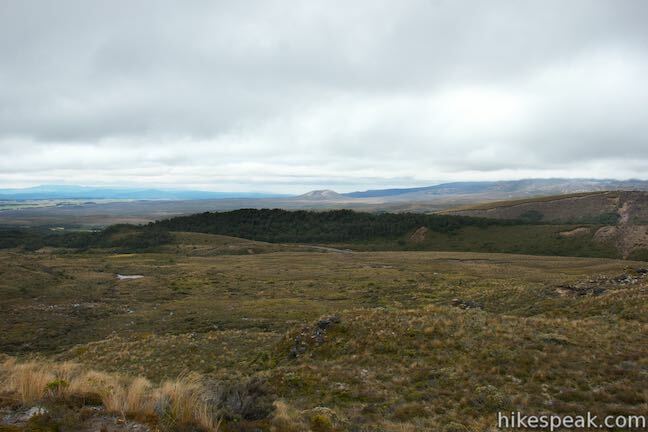 The small tarns visible are typical of the wet western slopes of Mount Ruapehu. 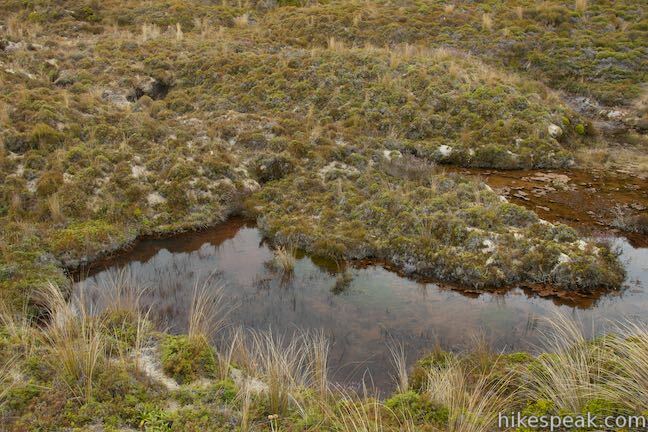 You may spot these tarns, which might be called vernal pools in America, where standing water creates shallow miniature ponds. 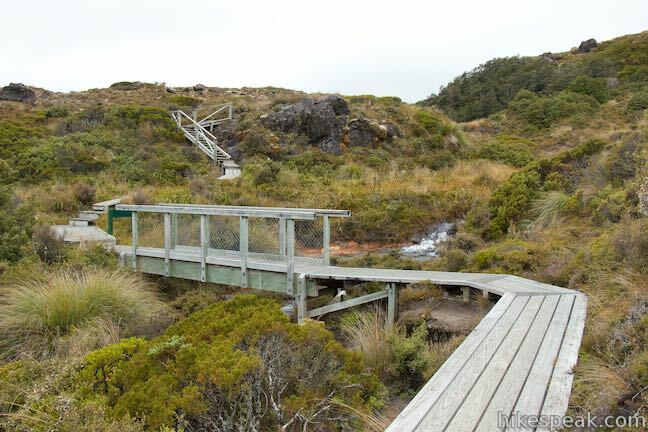 At 1 1/3 kilometers from the start, pass a bench, where you can relax and enjoy the peaceful surroundings. 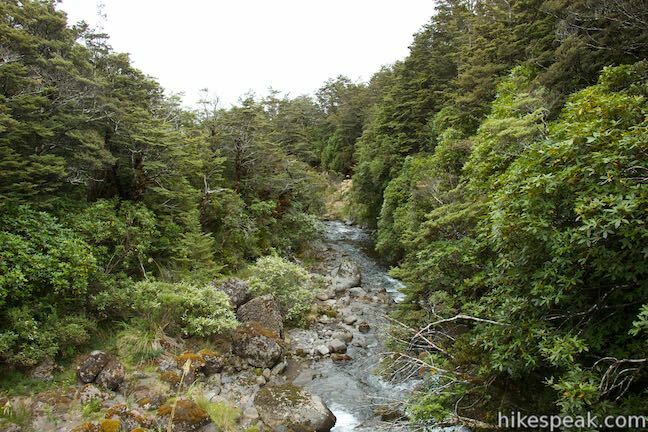 Shortly thereafter, return to the forest and cross a bridge over Waikare Stream. 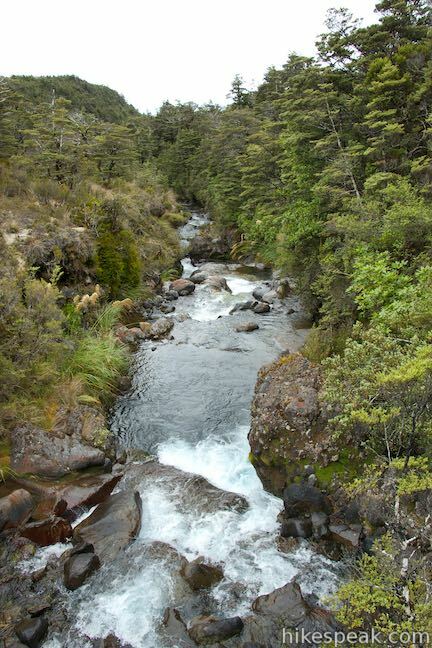 Cascades fill the swift stream above and below the bridge. 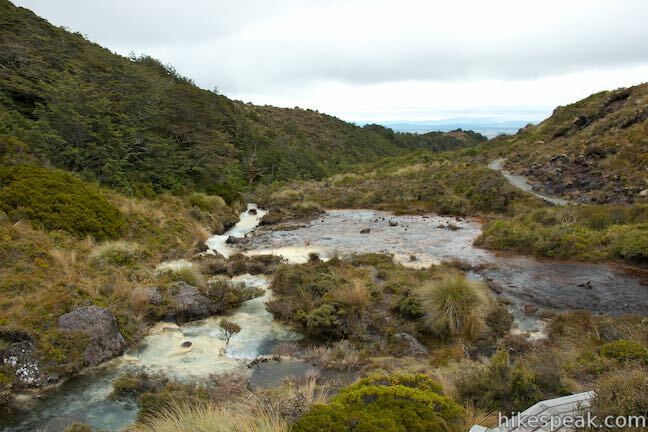 Waikare Stream flows from the Silica Rapids, which means you only need to follow it to reach the source. 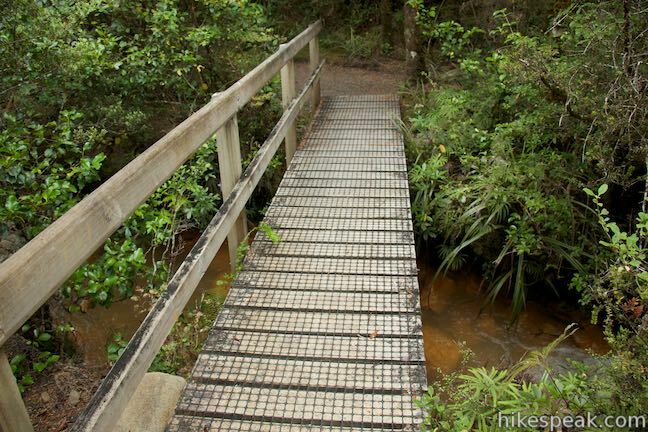 Just past the bridge and 1.6 kilometers from the start, approach a junction with Whakapapaiti Valley Track. 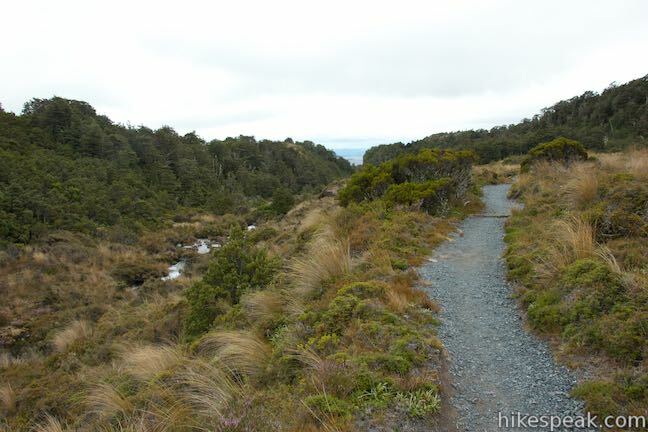 This track is a segment of Round the Mountain Track, a multi-day trek encircling Mount Ruapehu. 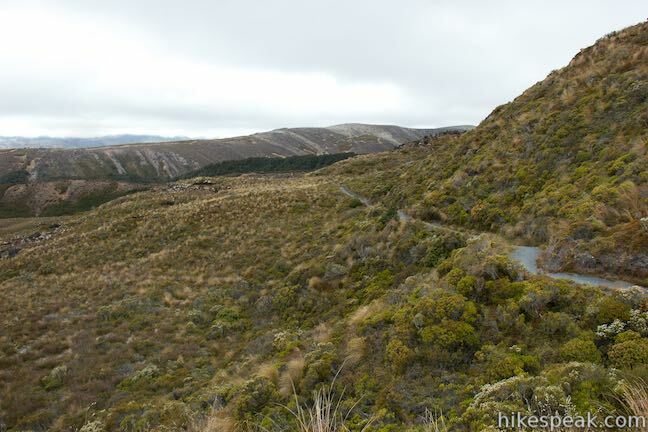 A marker at the junction says that it is a 1 hour and 45 minute walk up Whakapapaiti Valley Track to Whakapapaiti Hut. 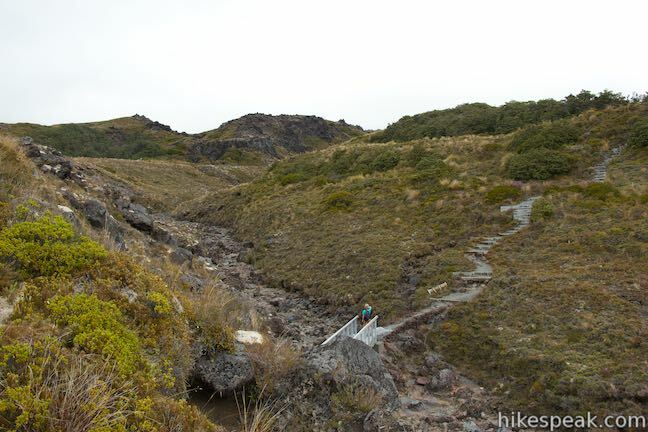 Keep going straight (stay to the left) to proceed on Silica Rapids Track. 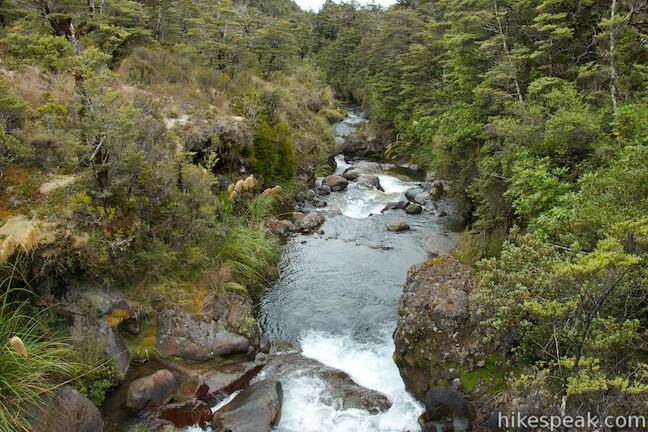 From here, it is another 1.8 kilometers to Silica Rapids, which the marker at the junction measures as 30 minutes away. 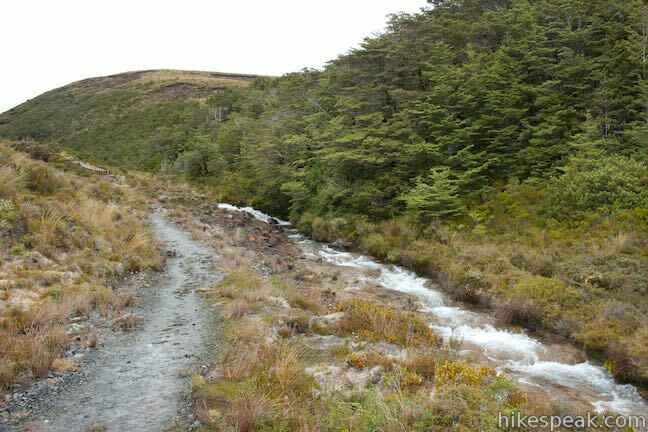 Silica Rapids Track ascends through woods along Waikare Stream. 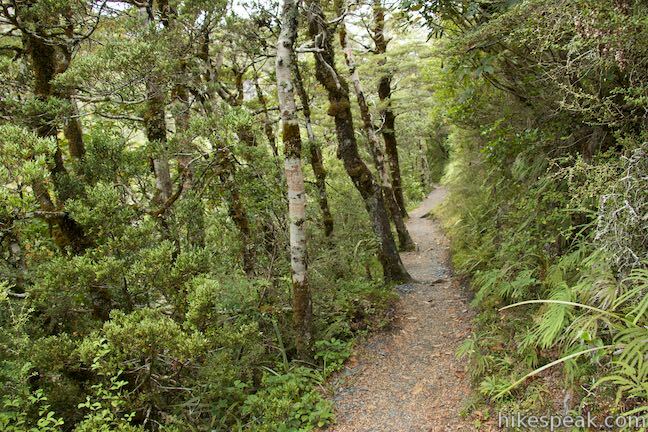 Beech trees dominate, but there are lots of ferns, mistletoe, and brush along the trail. 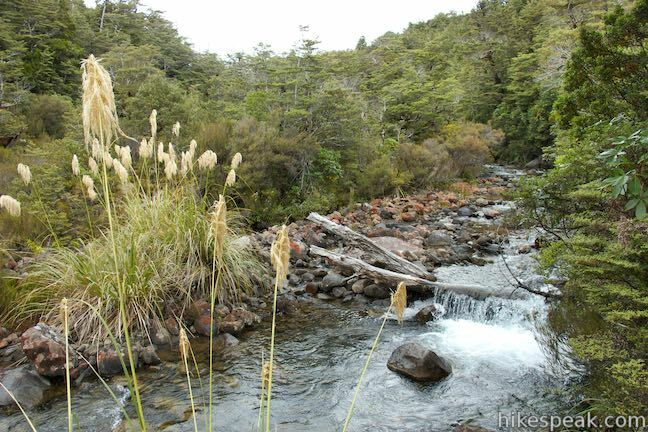 At 2.5 kilometers from the start, reach a potential confluence on Waikare Stream. 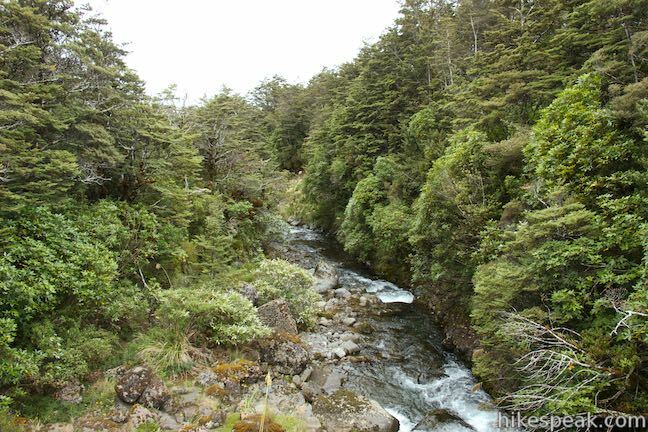 The main channel of the stream cascades down a slope alongside the track that is largely obscured by trees. 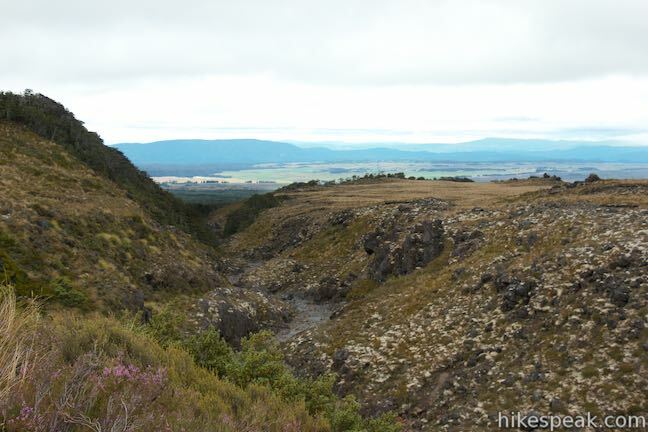 Across the narrow valley, Tawhainui Stream spills over the exposed cliffs of an old lava flow. 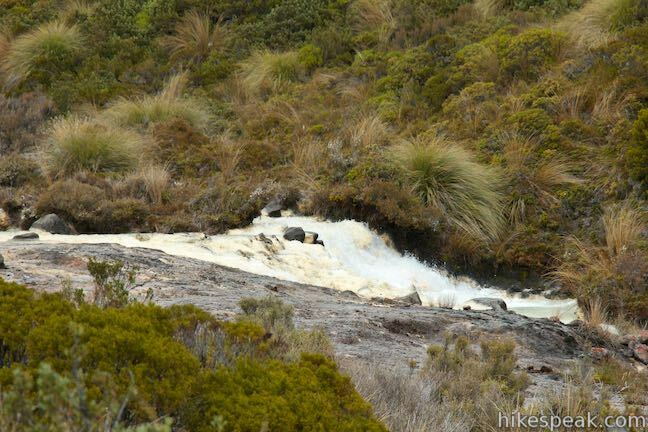 After heavy rainfall, Punaruku Falls manifests itself here. 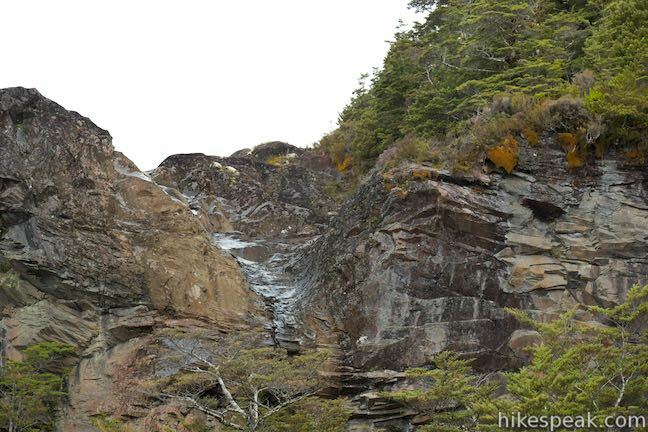 When the waterfall isn’t present, the wet stone is still easy to spot. 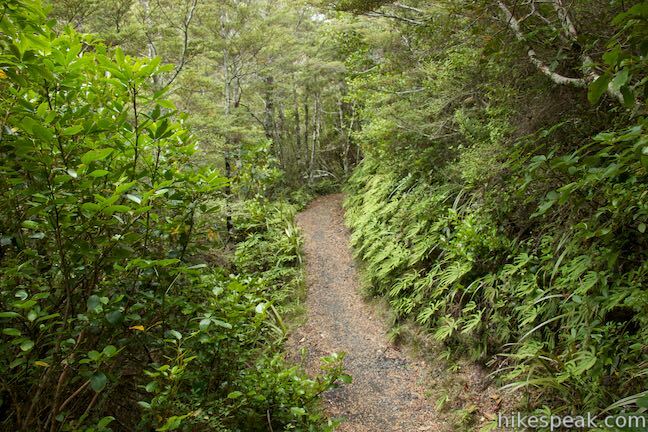 Continue up Silica Rapids Track and exit the forest. 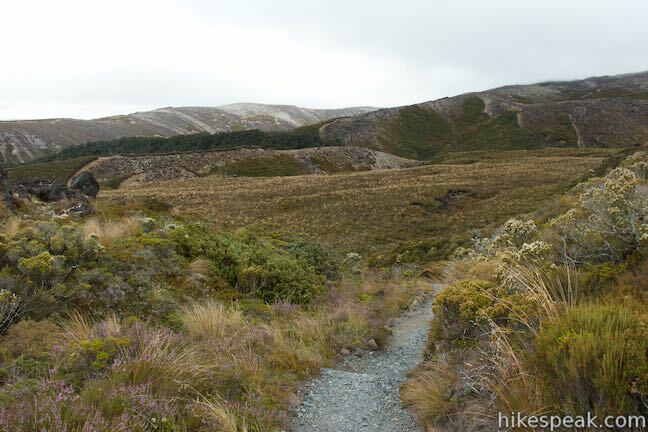 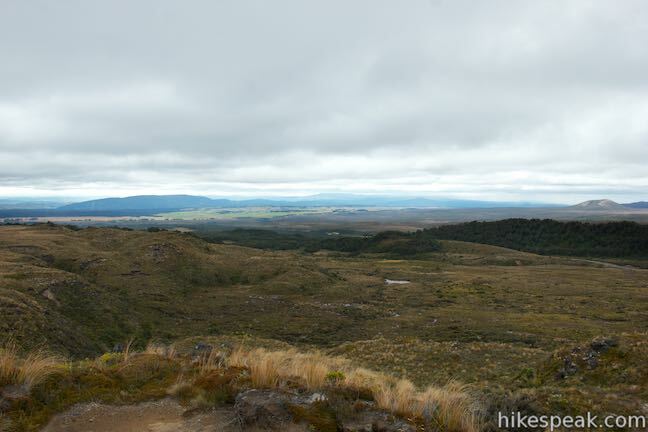 The surrounding ridges widen as you cross Waikare Stream and ascend a meadow full of tussock, alpine flowers, and occasional bog pines. 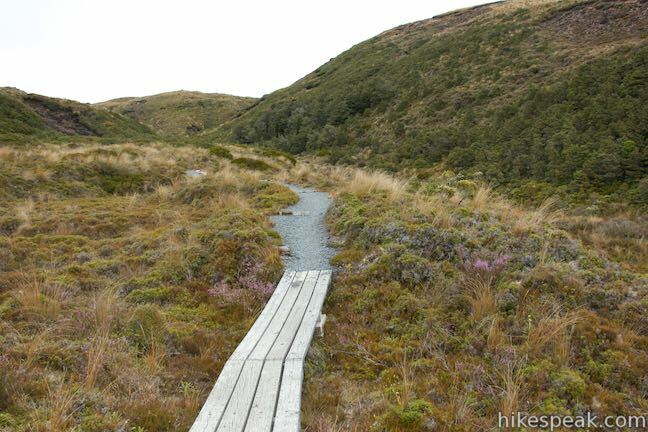 Progressing upstream, the dirt track gives way to boardwalk and there are signs that you are approaching the Silica Rapids. 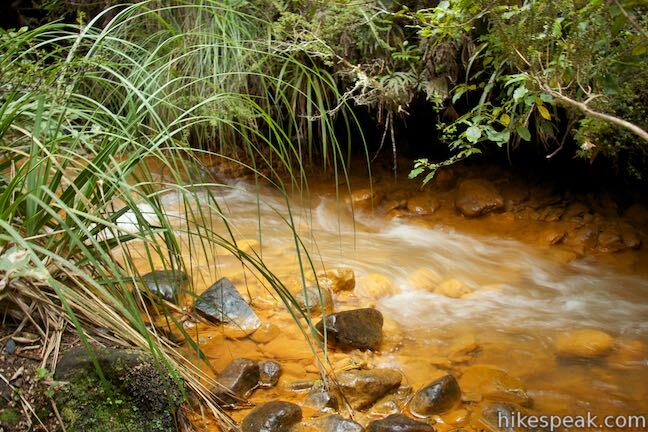 The iron-rich clays beneath the stream are broken up by aluminosilicate minerals of a paler complexion. 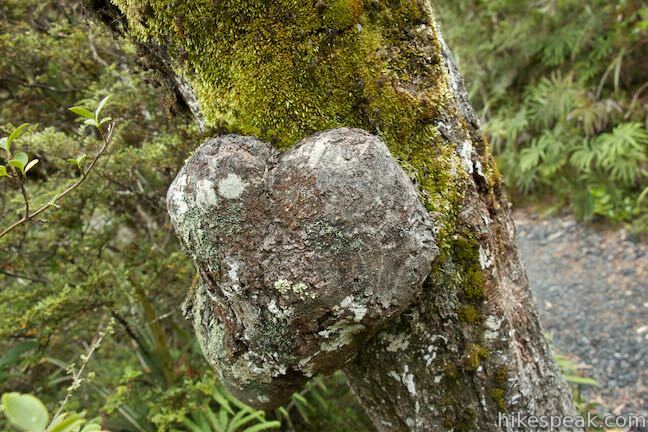 Silica is a white compound made up of oxygen and silicon that mixes with aluminum to create mother of pearl-colored earth that seems too pure to be natural. 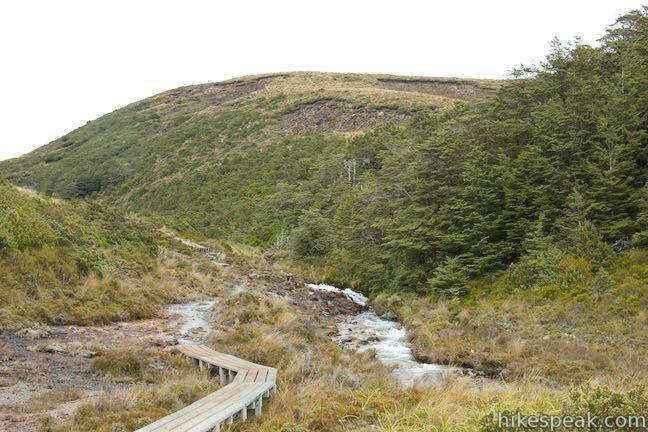 At 3.35 kilometers from the start, come to a junction in the boardwalk near the top of the valley. 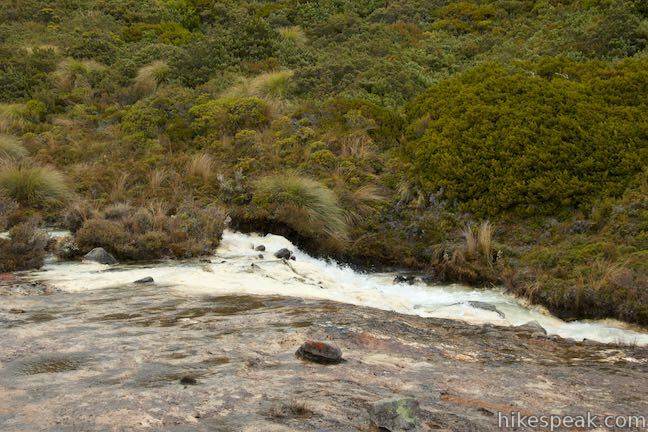 Turn right on a short spur to a viewpoint at the center of the Silica Rapids. 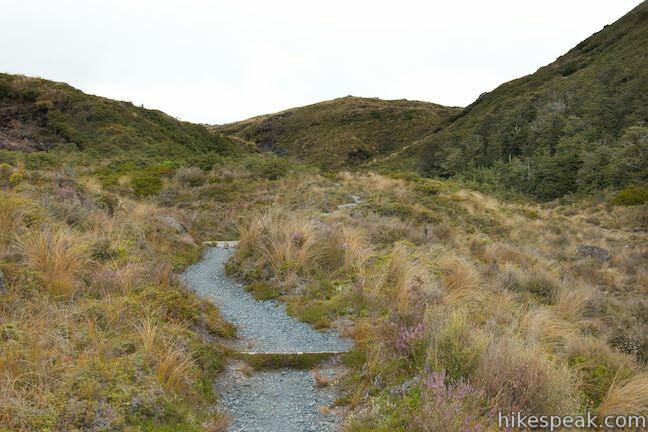 The track to the left, continues another 1.7 kilometers to its terminus at Bruce Road. 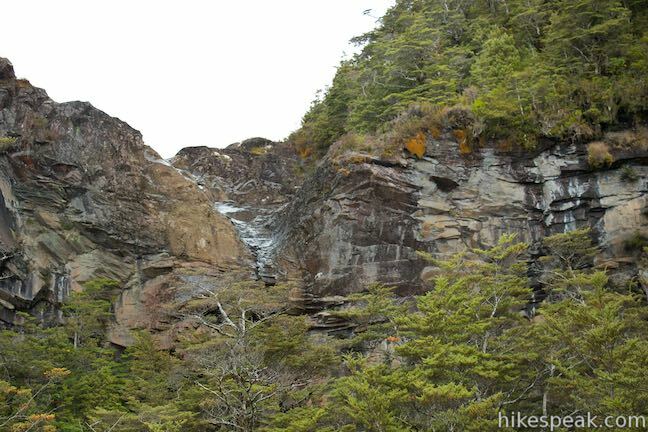 When the stream emerges from lava cliffs at the head of the valley, the water is rich in aluminum and silicate minerals. 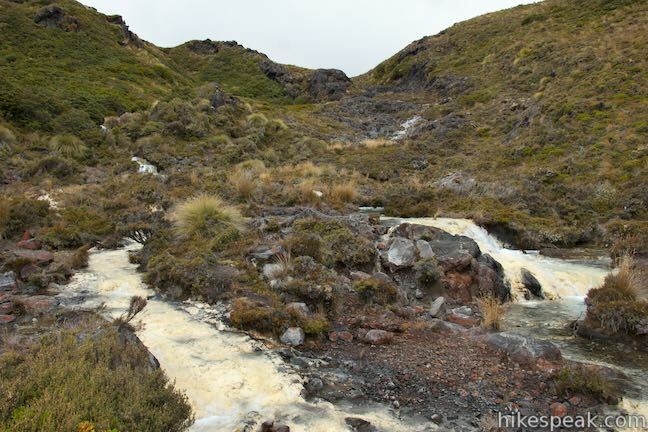 As the stream gathers speed and the water is aerated, the aluminosilicates are deposited on the stream bed. 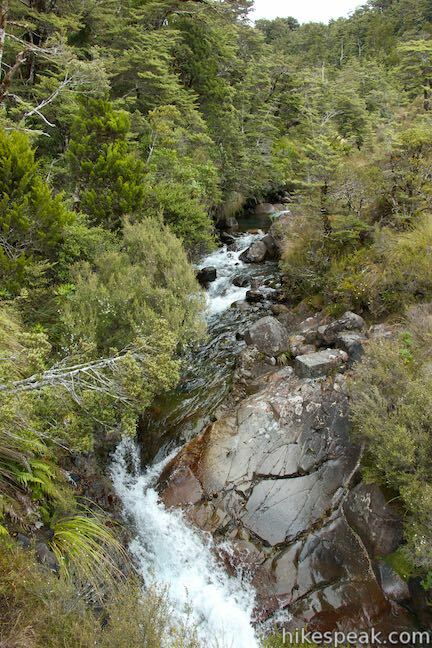 As water flows over the turbulent cascades, it releases carbon dioxide into the air and drops minerals like aluminosilicate. 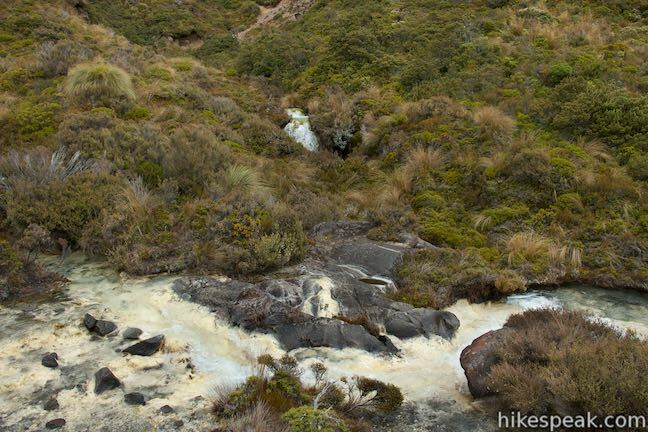 There are vibrant patches of other minerals among the long cream-colored runs of the Silica Rapids, creating a painter’s palette in the landscape around you. 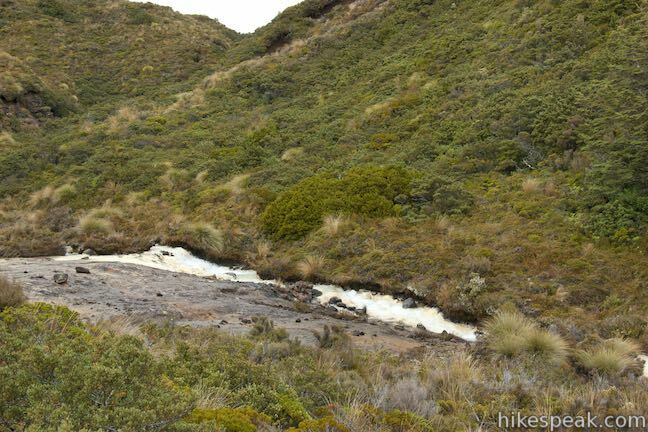 After reaching the Silica Rapids, 3.4 kilometers from the start, you can still continue up Silica Rapids Track. 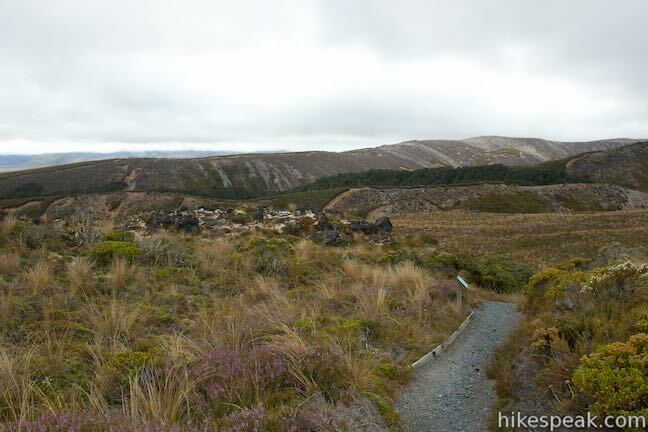 The track ascends through grasses and across a ridge, before dropping into a volcanic trench framed by dark boulders. 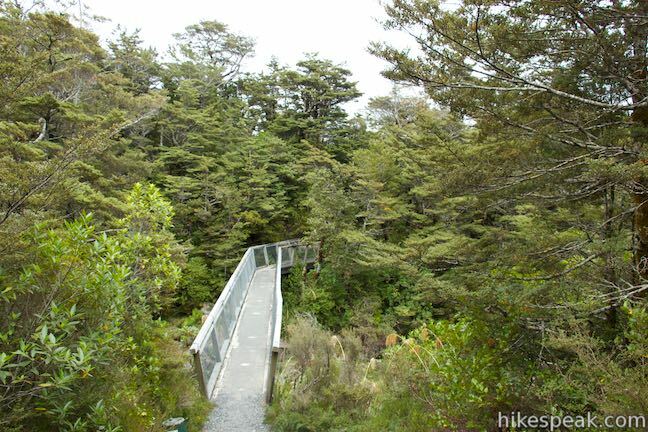 Cross a white footbridge at 3.9 kilometers and ascend the other side. 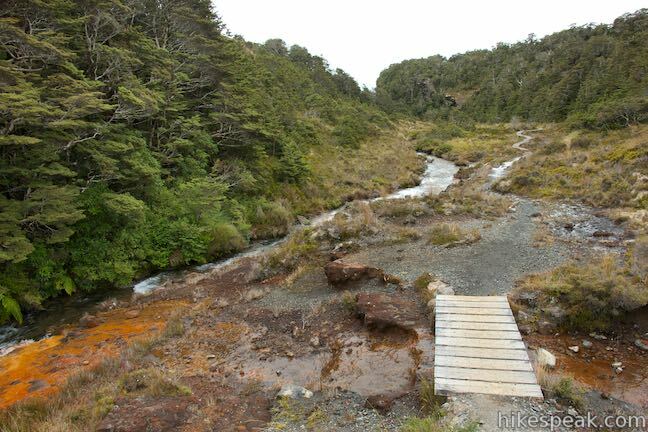 The potentially dry bed of Tawhainui Stream is below the bridge. 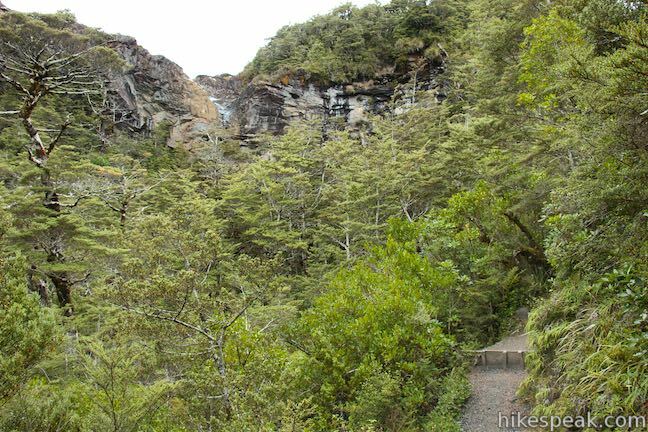 You are now upstream from Punaruku Falls, which was passed on the track below. 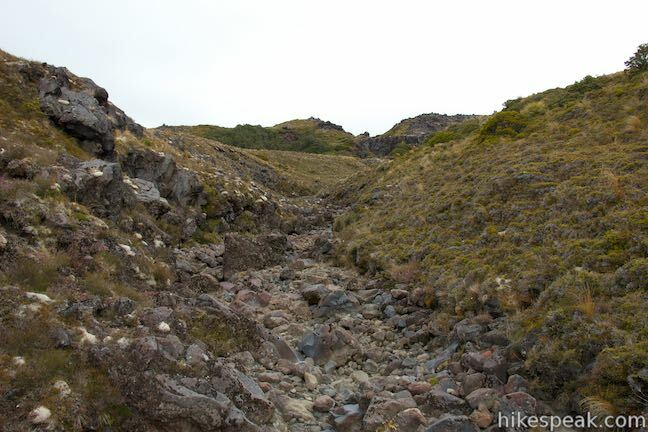 While the heat and violence of volcanic eruptions have formed this landscape, it is the extreme climate that breaks it down. 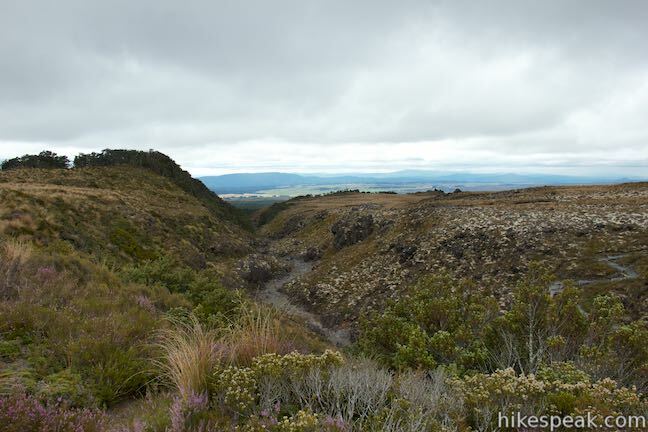 The ash soils, loosely bonded to underlying lava rock cannot withstand the forces of water, wind, and ice. 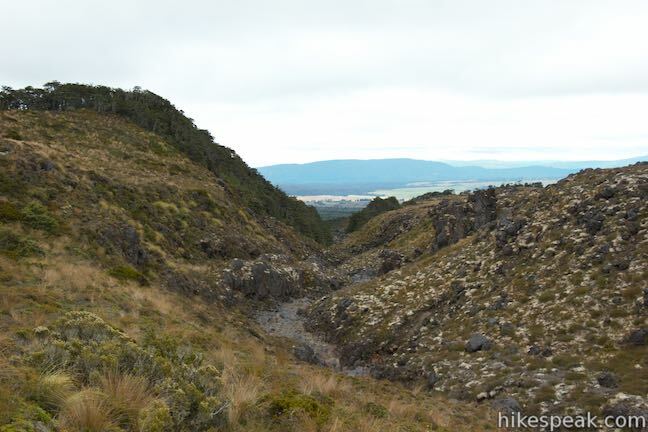 While the soils are more stable when cloaked by vegetation, the smallest disturbance of damage to this cover can accelerate the erosive process and strip the surface to expose the bare rock. 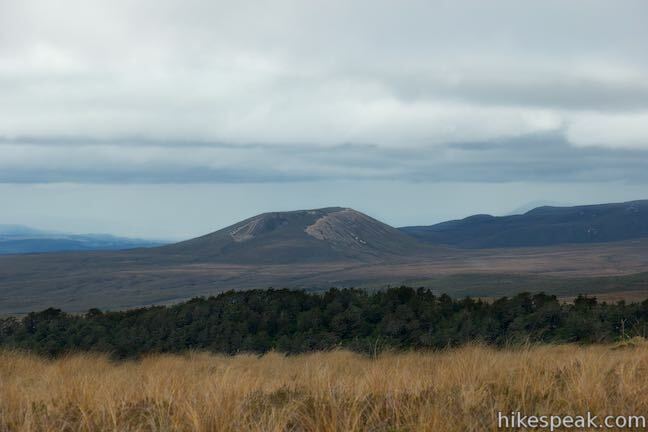 Erosion, volcanism, and glaciation make up the natural cycle that has shaped Tongariro National Park. 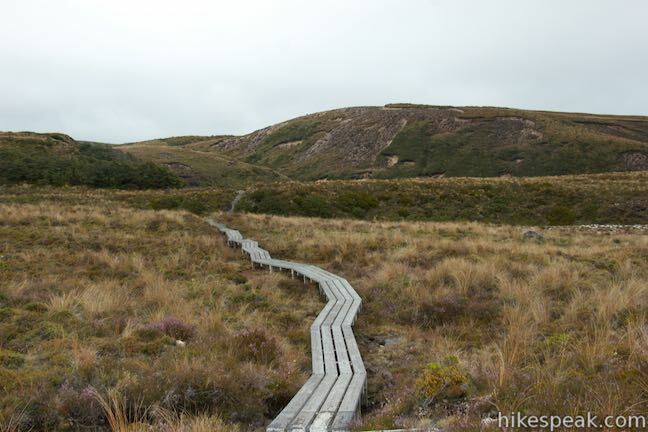 It is because the landscape is so fragile, that much of Silica Rapids Track is boardwalk. 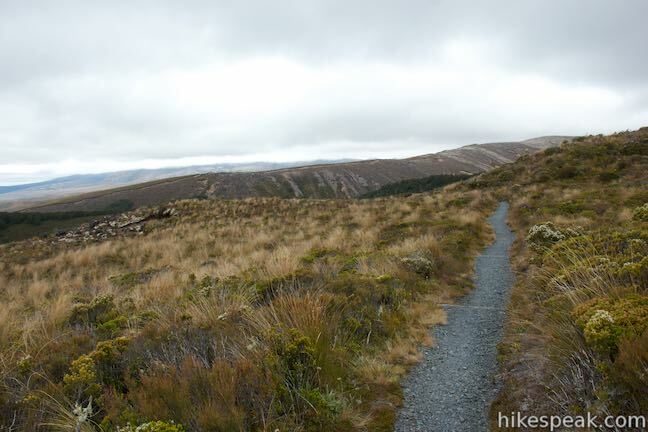 The track continues its scenic course east, winding over and across a rolling landscape. 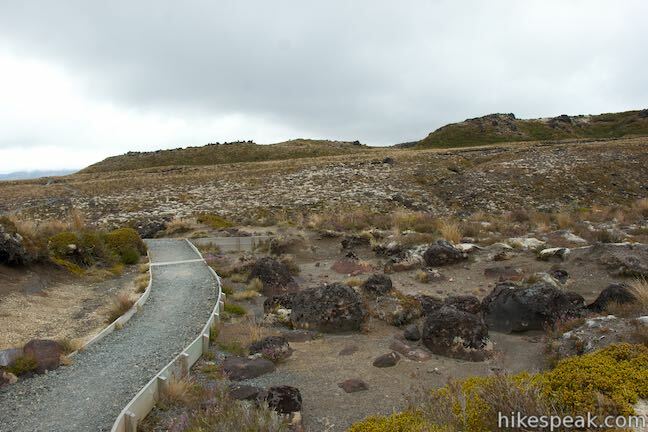 One final information panel describes a lava flow that the track crosses, 4.55 kilometers from the start. 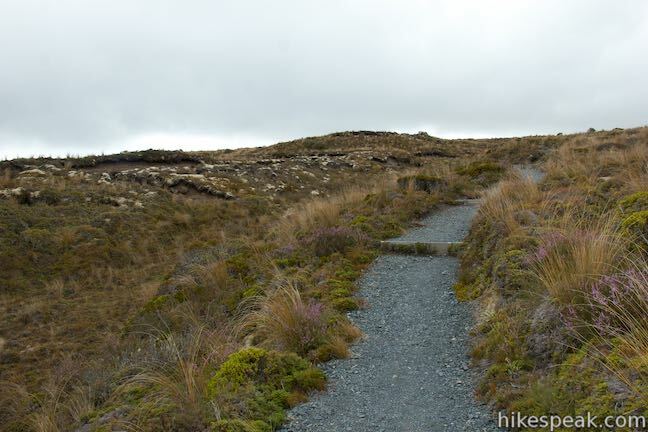 Outcrops of volcanic rock line the track. 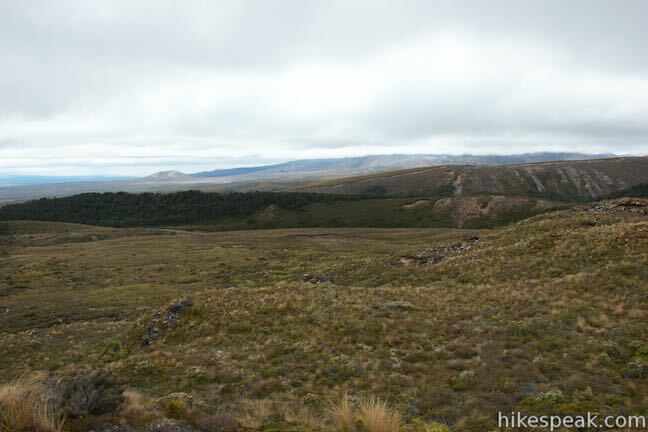 Less than 15,000 years ago, lava flowed from Iwikau Crater (now extinct) on Mount Ruapeu (New Zealand’s largest volcano, which lies just to the south) and created the landscape around you. 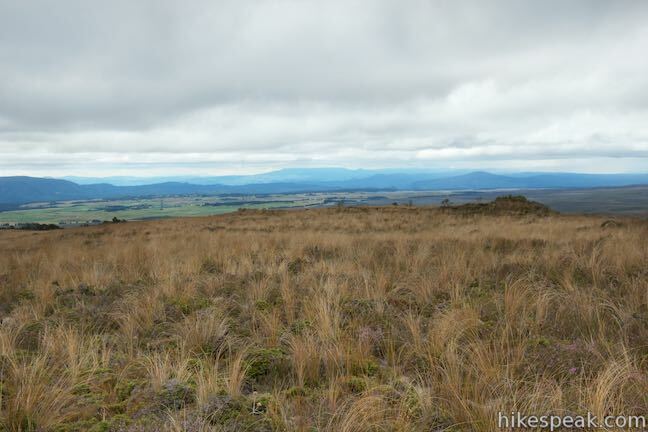 The panel explains why red tussock is the most common plant in this area. 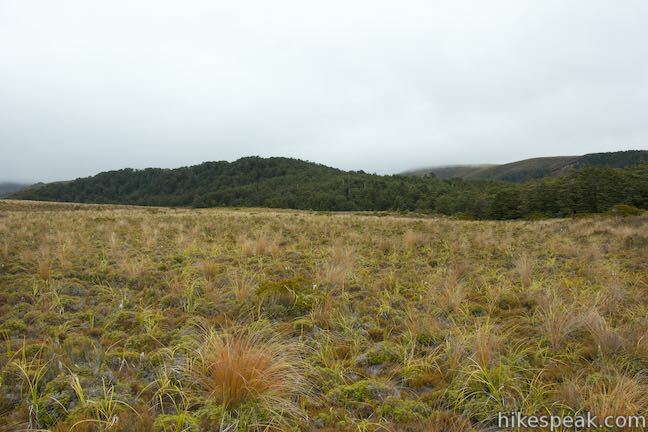 Tussock is one of the first plants to grow in ash deposits after the lava has stopped flowing. 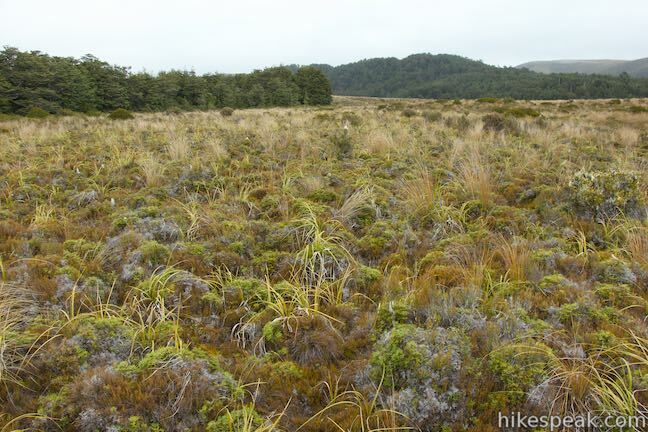 Once tussock takes hold, it helps create a suitable environment for other plants, but remains a dominant species in the tough environment. 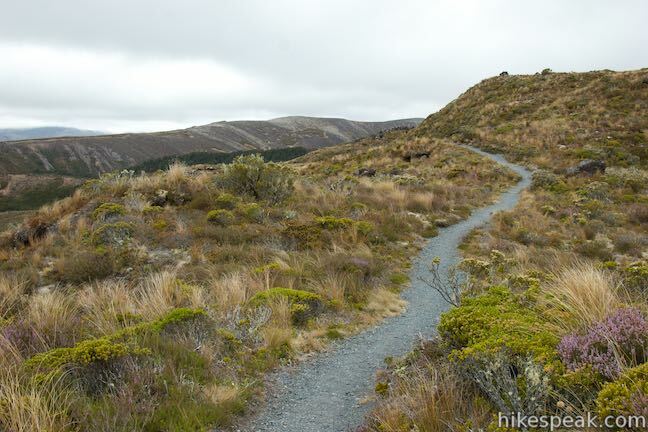 Near the end, Silica Rapids Track turns downhill, crossing ridges of old volcanic flows for the next 0.6 miles to get to Bruce Road. 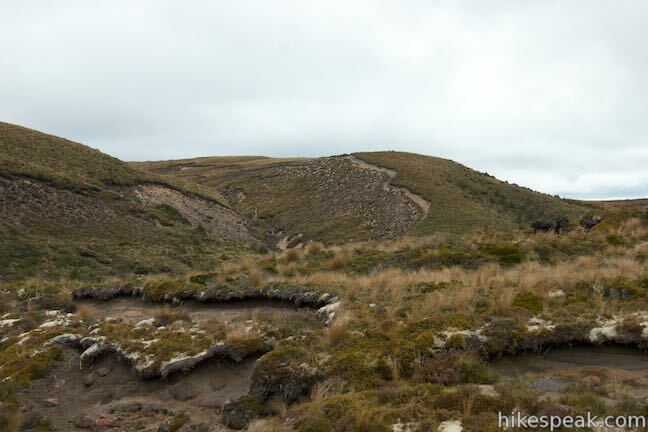 There is a big Department of Conservation sign for Silica Rapids at this end of the track. 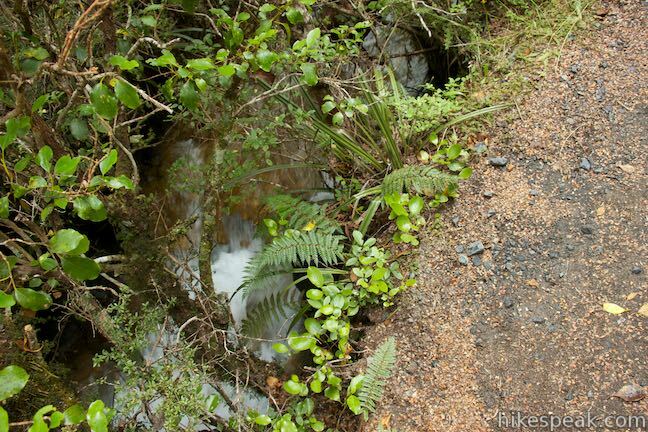 If you planned ahead and left a vehicle here or arranged to have someone pick you up, then your walk is done. 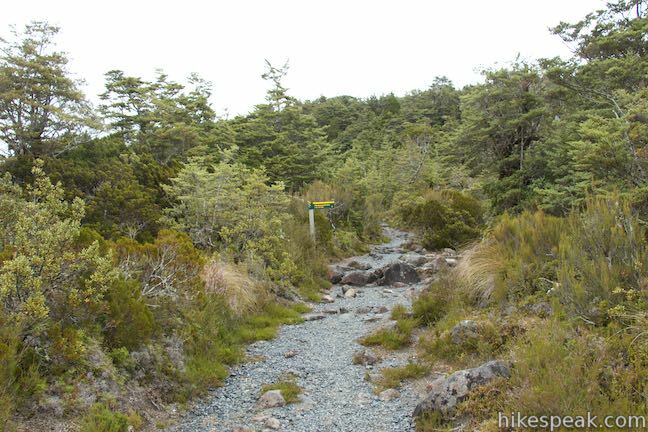 To make a loop of it, turn left down Bruce Road and walk two kilometers back to the car park next to the holiday park where the hike began. 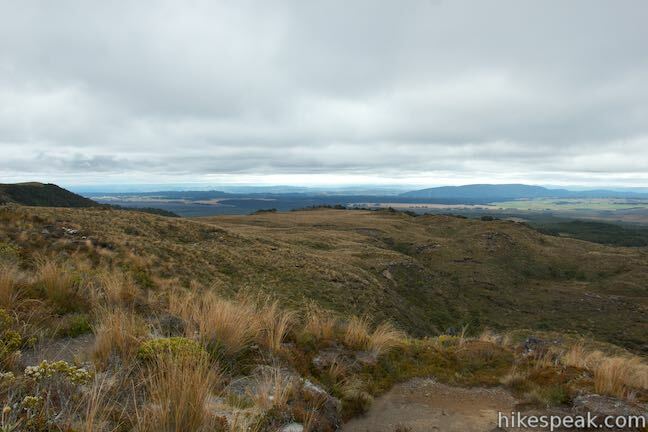 There is approximately 190 meters (625 feet) of elevation change along this 5.15 to 7.15-kilometer outing. 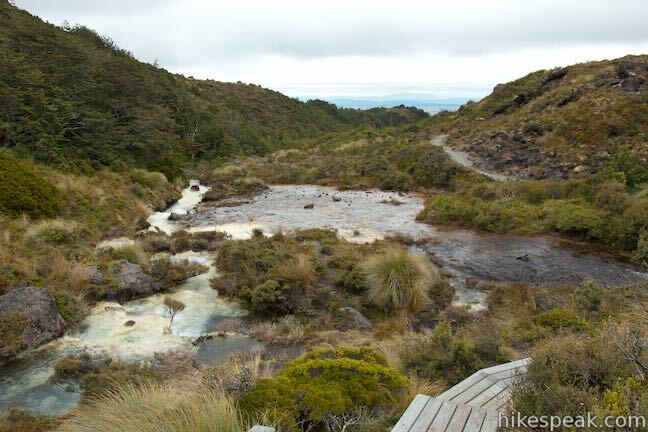 Dogs and bikes are not permitted on Silica Rapids Track, which lies within Tongariro National Park. 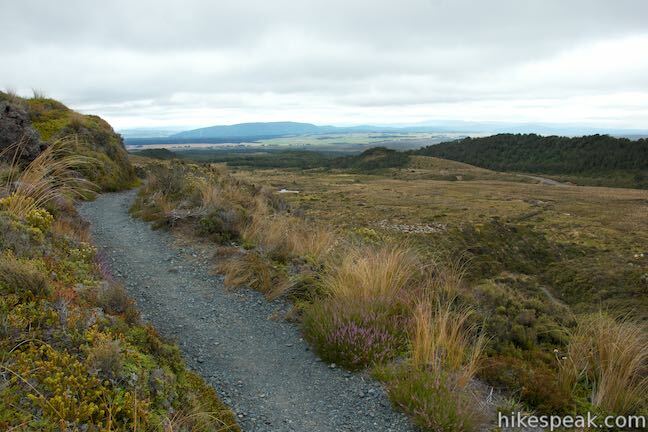 Convenient overnight accommodations are right next to the track at Whakapapa Holiday Park, and there are other nearby hiking tracks to explore like Taranaki Falls Track, Tawhai Falls Track, and Tongariro Alpine Crossing. 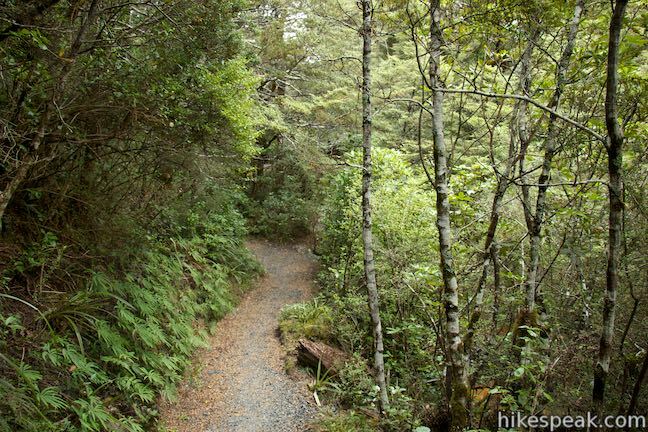 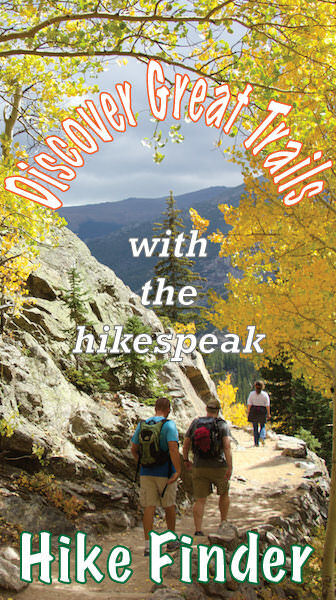 No fee or permit is required to hike Silica Rapids Track, so get out and enjoy! 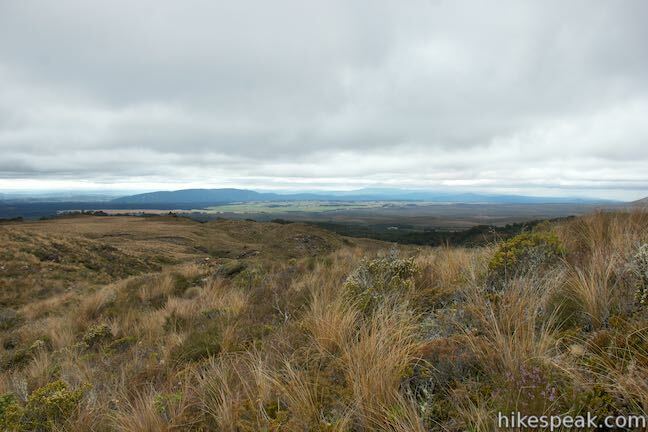 Directions: From Taupo, head south on State Highway 1 for about 50 kilometers to Turangi. 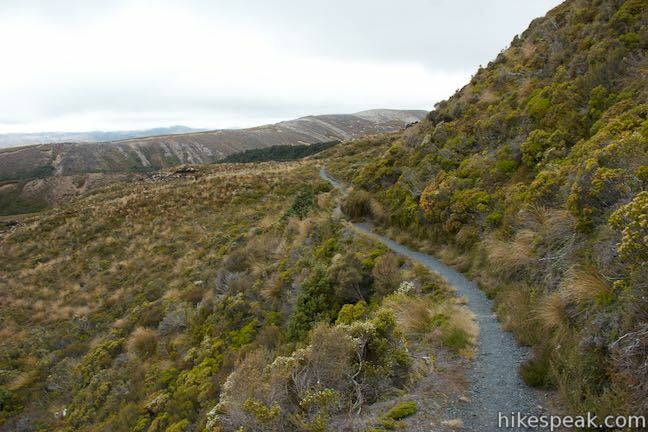 Turn right on State Highway 41, drive 2.7 kilometers and turn left on State Highway 47. 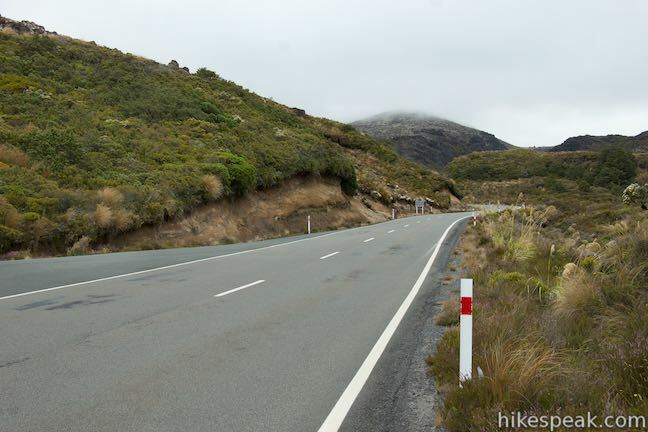 Take this road for 37 kilometers and turn left up State Highway 48 toward Whakapapa Village. 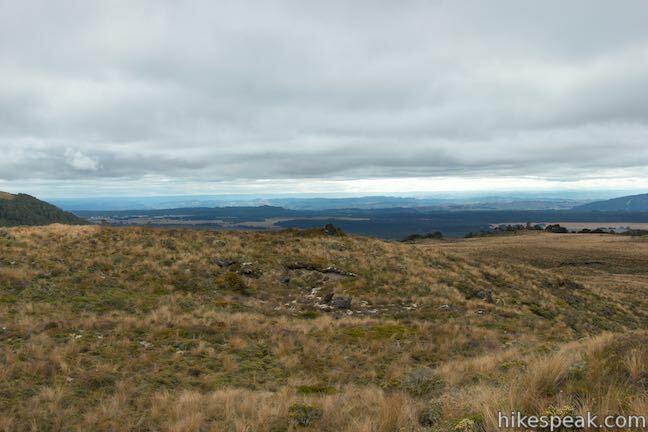 Drive 6.4 km to Whakapapa Village. 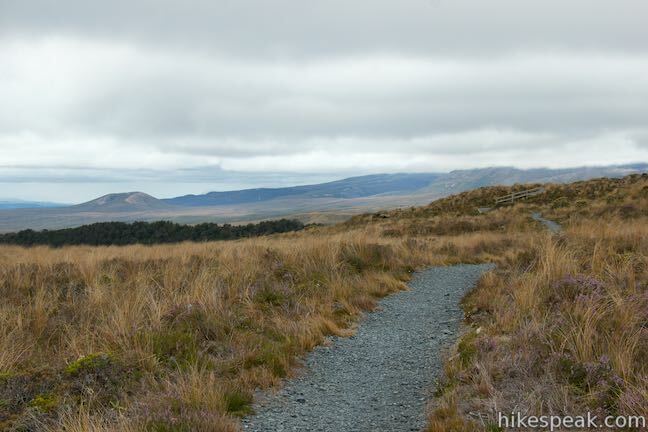 Pass Chateau Tongariro on the left and the entrance to the holiday park on the right (across from the Tongariro National Park Visitor Center), and pull into a small parking area at the start of Silica Rapids Track, just past the holiday park. 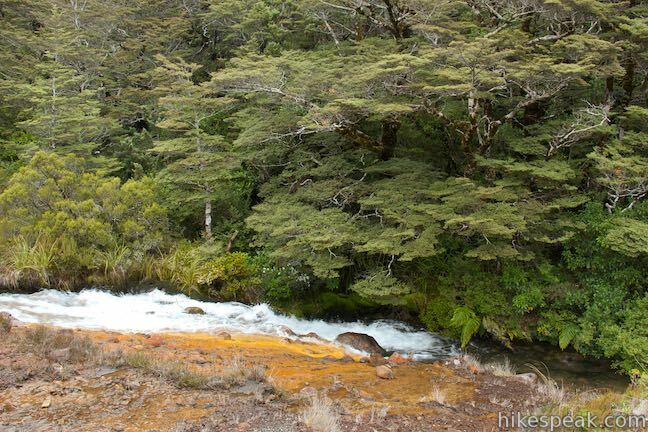 This 6.45-kilometer loop crosses a variety of volcano-influenced landscapes to observe a beautiful 20-meter tall waterfall in Tongariro National Park. 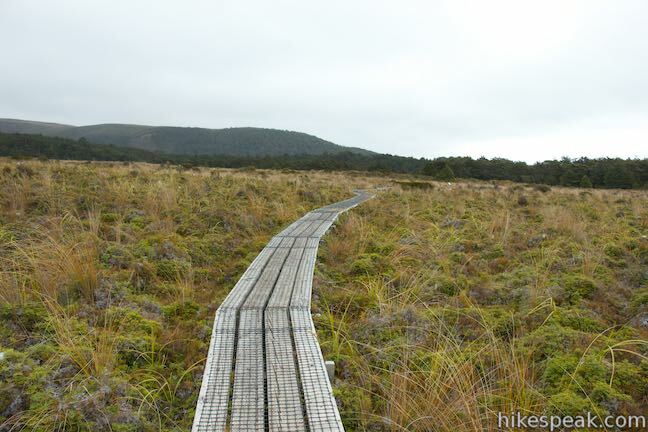 This 6.4-kilometer loop around Lake Rotopounamu (a.k.a. 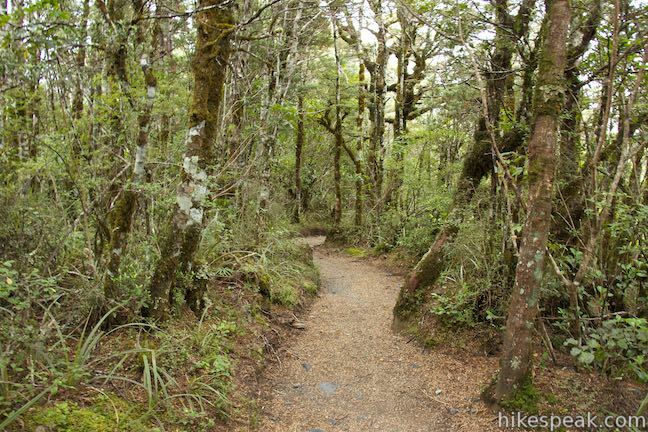 Greenstone Lake) visits tranquil beaches on a forest-wrapped lake in Tongariro National Park. 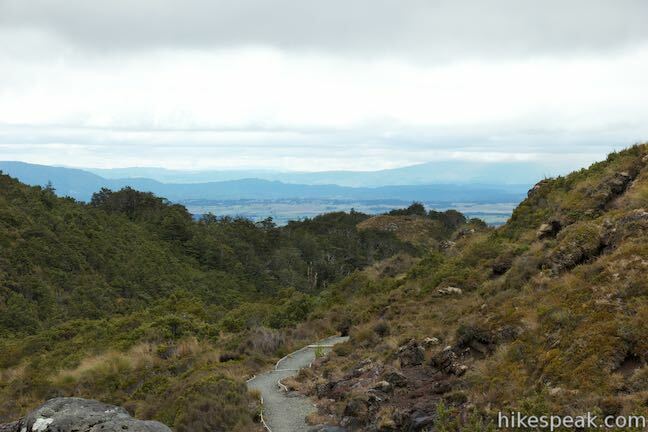 This 4-kilometer return hike reaches Tongariro National Park's tallest waterfall and passes through an alpine wetland that reflect views of Mount Ruapehu.